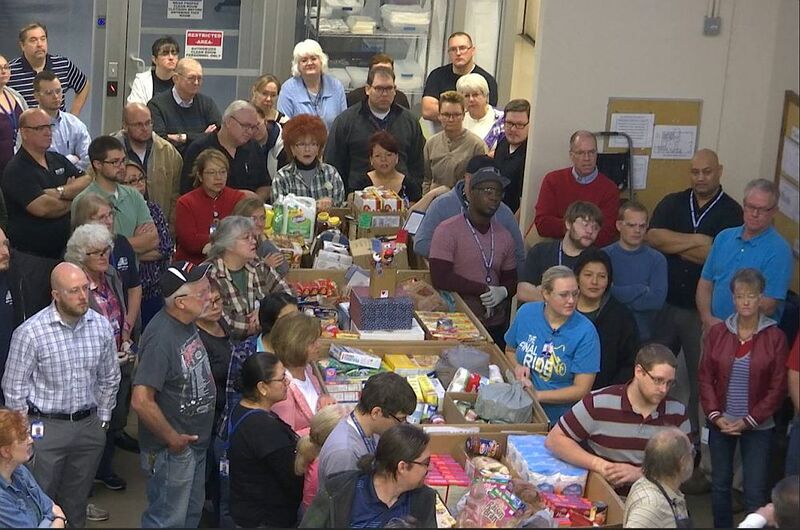 ST. GEORGE — More than 6,500 meals will be provided to needy Washington County residents because of the friendly competition and generosity of the employees of RAM Company of St. George. More than 200 employees divided themselves into two teams and began a friendly competition to see which team could gather the most food for donation. The two teams collected so much food for donation that it took eight pallets to hold the almost 8,000 pounds that was delivered Wednesday to grateful Food Bank officials. The project was spearheaded by Myron Fairbanks and Derrick Davies, both quality control inspectors. “When they came to us with this idea, we were all for it,” said RAM Company president Kevin Ganowsky. “We didn’t know what it would turn into, you know what I mean, but they just stepped up. They had a friendly competition. Employee Chris Johnson set up a GoFundMe page to solicit donations for the project. Funds started slowly, Johnson said, but after a few donations it started to pick up. “Together we came up with $1,150,” Johnson said. That amounted to six shopping trips for 2,000 pounds of potatoes, and lots of Thanksgiving products. The food collected by the employees will be augmented by a donation of 30 turkeys, generously provided by the Ganowski family. When asked if RAM Company would do this again, Ganowski smiled and said, “Yes, it was so successful, we really had a great time with it.